When people think of pastrami, most people think of it as a sandwich meat. Don’t get me wrong – I love a great Reuben sandwich! But have you ever considered using Certified Hereford Beef Pastrami as an ingredient? 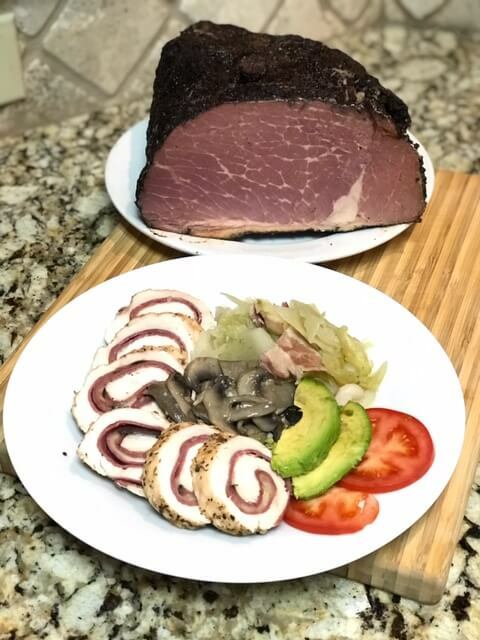 It’s rich beef flavor, along with the beautifully marbled texture and the great pastrami seasoning, make it a wonderful pairing with chicken. As a chef, I like to think outside the box when surprising my family with a delicious dinner. Unique flavors, texture and eye appeal are all high priority. The one thing I have always said about any meal is “we eat with our eyes first.” If it looks great on a plate, it will taste just as amazing! The incredible seasoning of the Certified Hereford Beef Pastrami allows for this chicken roulade dish to be very simple to prepare, with little prep time in the kitchen. Even the most inexperienced cook can make an impression on his or her guests with this dish. The most difficult thing is going to be keeping your guests from eating it right from the cutting block before you have time to put it on the plate! But first, you might be asking yourself – what is a roulade? Roulade originates from the French word “rouler,” which means to roll. A roulade is a dish cooked or served in the form of a roll, most typically a flat piece of meat spread with a soft filling and rolled into a spiral for cooking. I like to use a smooth cheese in this dish like provolone, but a Swiss or Havarti cheese would work just as well. Chicken Roulade is very versatile in that you can change the seasonings to your liking, along with the cooking method. I baked this dish in the oven, but it would also be fantastic on the grill! A white wine butter sauce would be a great finishing touch to this dish as well. With just the right amount of fat from the pastrami, this dish will come out very moist and juicy. Just be careful on how much you salt your chicken – our Certified Hereford Beef Pastrami is pre-seasoned, so you won’t need much! 1. Pre-heat oven to 300°F. 2. Butterfly chicken breasts and pound flat by using parchment paper and a mallet to pound the chicken to an even thickness, about a 1/4-inch thick. 3. Place three slices of Certified Hereford Beef pastrami on the chicken. Layer two slices of the provolone cheese over the pastrami and roll the chicken into a log. Repeat this step for both chicken breasts. 4. Lightly season the exterior of the chicken breast with salt and pepper to taste. Don’t over salt! Remember, the pastrami is already pre-seasoned. 5. Place the two chicken breast roulades on a cooking sheet and bake for 40 minutes, testing with a meat thermometer to ensure the chicken is cooked to 165°F. 6. Remove from the oven and let rest for two minutes. Slice the chicken and fan on the plate for the perfect presentation!